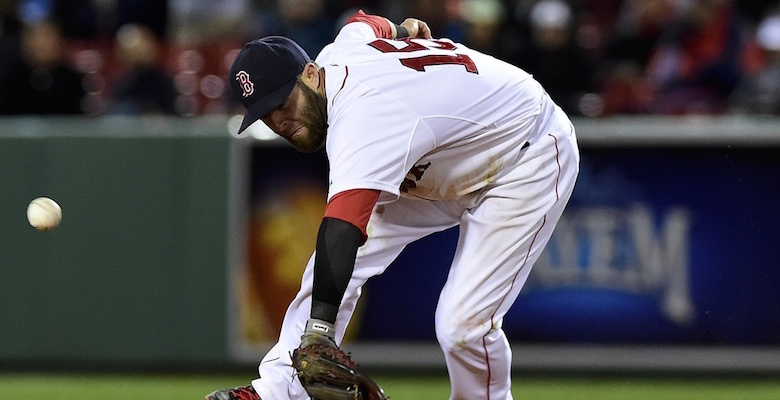 The 2015 Red Sox are not a good defensive team. How? Why? Let’s plow ahead! Learning about the defensive qualities of a team is a more complicated process than assessing the quality of any other aspect of a baseball team. Part of the problem in accurately analyzing defense is much of it occurs when we are not watching the fielders. A lot of fielding happens immediately before and after the bat makes contact with the ball. We don’t watch fielders get positioned, make good or bad reads on the ball, get good or bad jumps on the ball, and run good or bad routes to the ball, because we’re watching the ball. From a viewer’s perspective, defenders are removed from play until they are the play, and it’s often what they do with the time in between the start of the play and receiving our direct attention that determines how successful they are when our eyes find them. If you are reading these words you probably know errors and fielding percentage aren’t sufficient enough to tell us anything about a team’s defensive abilities. Fortunately we have more advanced defensive metrics to help us out. And yet it seems sometimes they don’t really help all that much. Often it can seem that two different defensive metrics will give us two completely different pictures of a player’s defense. That’s because defense is a tough thing to measure accurately and fairly, and especially so on an individual level. My favorite defensive stat is Defensive Efficiency. Conceptually it’s a simple stat. DE measures the percentage of defensive a team turns into outs. As such it’s a measure of team and not individual defense, which I like because it’s simple and answers the question “how good has this team been in turning batted balls into outs?” It comes with some problems, such as being skewed by pitcher quality and park effects, but I like it because on a base level it tells you who is getting outs and who isn’t. Right now, through Tuesday’s games, the Red Sox are turning 69.3 percent of batted balls into outs. That’s 24th in baseball, tied with Pittsburgh. For context, the best team is Kansas City at 74.8 percent and the worst is Cleveland at 65.4 percent. Despite the 24th ranking, the Red Sox are right in between the best and worst team, and yet it shouldn’t be lost that there are 23 other teams better than they have been at getting outs from batted balls. It’s not hard to see why they’ve given up 139, good for the second most in baseball. And yet there is a bit of chicken and egg element to this. Are Red Sox pitchers giving up lots of runs because the defense isn’t doing its job, or is the problem that Red Sox pitchers are giving up hard contact too frequently? If you’re curious, 20.2 percent of batted balls allowed by Sox pitching have been line drives. League average is 20.9 percent. So, at least by these admittedly imperfect measures, it doesn’t appear Red Sox pitching is putting an undue strain on the defense. And yet the defense is allowing 5.5 percent more batted balls to fall in than the best defense in the league and 1.8 percent more batted balls to fall in then the median defense (Minnesota). That might not seem like much but it’s more than a hit a game extra than Kansas City is allowing and a bit less than a hit every two games more than Minnesota is allowing. The defense is allowing 5.5 percent more batted balls to fall in than the best defense in the league and 1.8 percent more batted balls to fall in then the median defense. When evaluating defense it’s a good idea to not pin your opinions on one stat. So let’s open up the floor and see what other metrics think of the Red Sox defense. FanGraphs hosts a number of different defensive statistics, like Defensive Runs Saved (DRS) and Ultimate Zone Rating (UZR), which uses play-by-play data. The Red Sox are 25st in UZR and 24th in DRS. One of the more interesting stats is Fielding Runs Above Average at Stat Corner, because they break it down by ground balls and fly balls. The Red Sox are 11th in fly balls, but 25th in ground balls. Ah ha! Maybe! You can look up defensive numbers just as well as I can, so in short FanGraphs thinks the culprits are Dustin Pedroia (-0.8), Pablo Sandoval (-2.4), Mike Napoli (-4.2), and Hanley Ramirez (-7.5). BP’s FRAA sees Pedroia as a plus player (i.e. not the problem), Sandoval as a negative (-1.1), Napoli as league average (-0.1), and Hanley Ramirez as the worst of the lot (-1.7). Interestingly FRAA also hates Xander Bogaerts’ defense (-2.3) while FanGraphs has him at just below league average. The short of this thing is something you already know if you’ve watched any Red Sox games this season, which is Ramirez is a 40 car pileup-level disaster in left field. What the stats are telling us is that, at least so far (Beep! Beep! Small sample size warning!) Napoli has hurt the Red Sox both at the plate and in the field. Sandoval has been less than advertised defensively, and Pedroia has had a tough month at the keystone. I’m not a scout but I have watched every Red Sox game and my eyes tell me Pedroia is as awesome as ever. I’ve also observed that Sandoval hasn’t made all the plays that you might expect of a player with his reputation, but he has made a bunch of good plays, especially lately, so I’m chalking that up to a tough month as opposed to a degradation of skills. I would expect that over the course of the season both Pedroia and Sandoval’s defensive numbers would improve. Napoli hasn’t had the best month defensively either, but considering his age and his career numbers at first, it’s unlikely he’s fallen off the cliff. It’s definitely something to monitor, though. As for Hanley, I thought that as a shortstop his skills would translate more easily to left field than they have. It’s likely that he’ll improve out there with more time, but he’s been so bad that it’s difficult to imagine him ever being better than below average. As long as he’s slugging .600 that’ll be fine though. Just as at the plate, the Red Sox have some guys under-performing in the field. Some better pitching will likely help the fielders along, just as better fielding will help the struggling pitching staff. It’s a symbiotic relationship and it probably feeds upon itself more than we generally think. Defensively, the Red Sox aren’t going to be the Royals, but they don’t have to be. They do have to be better than they’ve been and that should be the good news to end on, because it’s only early May, the Red Sox have the capability to play better defense and the time remaining for it to matter in the standings.